Create your own custom view of the future... then make it real! 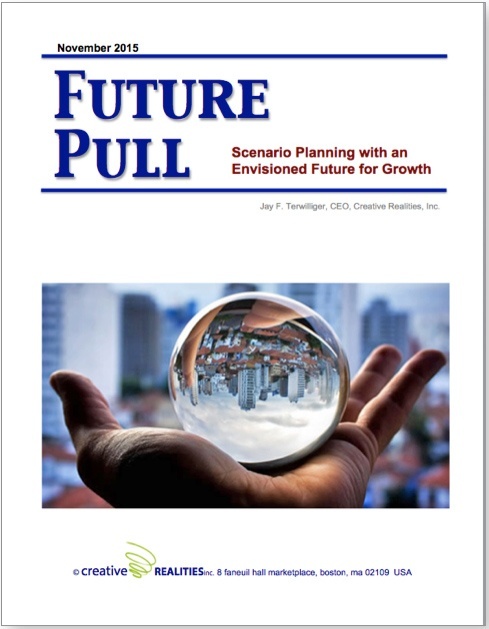 Future Pull is a Scenario Planning approach to create an envisioned future. Having an "Envisioned Future" is critical to decision-making for innovation, and for empowering your organization to be more agile and effective. Today’s leaders cannot afford to wait and get run over. They must be prepared to take reasonable risk, and to make difficult decisions before all the supporting data exists. Leadership requires a gut-level view of how the future will unfold and what you must do to be relevant and to win in that future. For innovation, having this Envisioned Future enables decision-makers to avoid the "imaginary number" criteria of ROI and NPV (which if an innovation is truly new, are by definition guesses), and instead, invest in the opportunities and capabilities they will need to win in their future.